Google stepped away from the Nexus family in 2016 and launched the Pixel smartphones, adopting the line of the previous Chromebook Pixel and Pixel C and presenting a Google-designed premium product. The Pixel 2 XL is the second-generation large-scale phone, looking to replace one of our favourite 2016 phones. At launch it was an ambitious device – more so than the not-too-dissimilar Pixel 3 models which launched in late 2018 – switching to an 18:9 display and looking to refine the bodywork of the original phones. But somewhere along this road Google hit a bump with display quality. Here's how, since release, Google has been ironing out the kinks and now, with Android Pie 9.0 loaded, the Pixel 2 XL is a serious phone to consider – if you're looking for a cheaper alternative to the more recent third-generation options anyway. What's new for the Google Pixel 2 XL? Google has retained a design quirk in the Pixel 2 XL: it's got that split two-finish rear, as we saw on the original model (and as continues in the third-gen line too). It's reduced on this model – which, by the way, is manufactured by LG – leaving only a small section at the rear top that's glass, with the rest of the body metal. The front is all glass, with the surface curving at the edges to flow into the aluminium bodywork. The fit and finish is great, displaying great quality in all directions and coming in two colours: black or black and white. The black version is a little more stealthy, while the black and white version is adorned with an orange power button. Little details matter and this gives the design a lift, although the general theme here seems to be slightly understated compared to the more showy iPhone X or Samsung Galaxy devices. This Pixel phone is IP67 rated, giving it the water-proofing which it needs to sit in this flagship position: the original version wasn't and that was the biggest criticism of the phone. The metal work is also coated for a surface that has some grip: this doesn't feel like the metal body of the iPhone, it feels distinctly different. However, the first thing you might notice about the Pixel 2 XL is that it's a bit larger than it ought to be. It's only slightly smaller than the iPhone 8 Plus, so despite the shift in display aspect – it's 18:9 now, with the aim of giving you a big screen without a big body – the Pixel 2 XL doesn't really achieve that aim. People are expecting smaller phones these days, hence the iPhone XS's existence. One of the things the Pixel design allows for is front-facing stereo speakers. The performance from those speakers is good, but only good, so they perhaps don't justify the space they're given. They're no match for HTC BoomSound, lacking the richness and volume of HTC's solution. Other things to note in this Pixel is the 3.5mm headphone socket is absent, so it's USB Type-C for audio (or the dongle in the box to use your old headphones). The fingerprint scanner remains on the rear in a sensible place on the rear, which we found it perfectly fast to unlock the phone. It also offers a swipe shortcut to quickly pull down the notifications area. The display is worth a few more words than normal. As we've already detailed, the Pixel 2 XL moves to a new display aspect compared to the original, bringing it in line with other modern flagships. It is, we suspect, the same panel that's used in the LG V30, given that it's referred to as P-OLED (which LG tends to use as Samsung dominates the AMOLED nomenclature) and the exact same size and resolution. But when the Pixel 2 XL initially launched, it looked totally different. We all expect an OLED display to give nice deep blacks but also vibrancy and pop. But the Pixel 2 XL lacked when it launched, which drew a lot of criticism. Google clarified the position, saying that the Pixel 2 XL has been tuned to look more natural and support a wider colour gamut. In that "natural" state, this display looks pretty flat and lifeless compared to any number of existing devices. There is a strange dichotomy to this Google display: while things like your Instagram feed won't have the sheen that all other top smartphones offer, the Pixel 2 XL's display works really well in particular conditions. Watching Star Trek Discovery on Netflix, for example, the Pixel 2 XL looked many times better than the LG V30; by contrast, LG's phone looked red in shadows and noisy in lower light scenes, despite LG claiming that it would be showing the HDR version. A fix for the muted display was released, however, adding a new "saturated" option. While some supported Google's original position of "natural", we found it lacklustre. Fortunately, the release of that additional display option pulls the phone back into the enjoyment zone for us. With that mode engaged, the Pixel 2 XL is more comparable to other flagship phones. Some people have complained about "burn-in" on early devices, too, although we've not seen this on the second Pixel 2 XL that we have. Others also criticised off-axis colour shift, but this was never as big a deal as the display tuning itself. With the display behind us, it's easy to say that the Pixel 2 XL is every bit the powerhouse. It was released at the tail-end of 2017 so, yes, some more recent 2018 devices offer more RAM or other smarts that put them a whisker ahead, such as using Snapdragon 845, but the difference is small for most tasks. Importantly the Pixel 2 XL runs fast and smoothly. We would extend this further and say that Google's pure Android software means that the Pixel 2 XL often runs smoother over long periods than some Samsung devices. That's even better with Android 9 Pie. It's here that you'll notice a benefit over the older device too: it will handle some more demanding tasks with ease. For example, you won't get asked if you want to turn down the graphical textures in Total War Battles Kingdom, because the phone can handle it. Google points to the hardware race in smartphones, preferring to say that AI is part of the future for making phones better and that it will be machine learning that enhances experiences, not entirely the core hardware. It depends, of course, whether it's the Google AI experience you want. Where that'll go, well, we'll have to wait and see. Turning to the battery and the 3520mAh cell in the Pixel 2 XL provides good day-long performance. As with most of these large format devices, it's fairly easy to get through a day with some left in the tank. Fast-charging is in place to bring that battery back into contention, using that USB Type-C on the base. The Google Pixel 2 XL was the first phone to feature Android 9.0 Pie. This added gesture controls (not on by default when updating), a multi-tasking screen, digital wellbeing features, and more. Watch the video below for a breakdown of the top features. Pie essentially evolves what was present in Android Oreo 8.0 when the Pixel 2 XL first launched. And that already added great things like the Pixel Launcher, which changed the relationship between the home screen, Google app and search. The search bar at the bottom of the home screen gives you live search results both for your contacts and Google searches, as well as offering up common apps that you use, including slices of content from within apps (such as a commonly messaged friend on WhatsApp) appearing within the apps drawer. What's most important is that pure Android is slick, fast refinement. Android sticks to its own services in Google Play (music, movies and apps) and supports functions like Cast, leaving a lot of the wider expansion to AI, through Google Assistant. Google Assistant is perhaps Google's most aggressive foray into other devices and platforms, because you'll have lots of options to control other home devices. That functionality from Google Home flows into Android devices, meaning you can control things like Nest heating or Hue lighting with your voice. 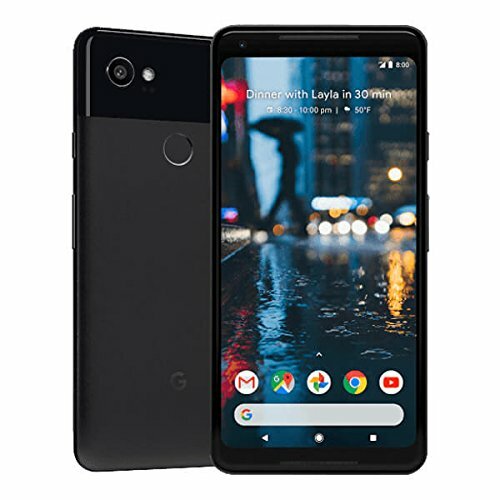 One hardware addition on the Pixel 2 XL is the ability to squeeze the frame to launch Google Assistant, rather than saying "Ok Google", or long pressing the home button. It's a gesture adopted from the HTC U11. Perhaps more useful is the ability to squeeze to silence a call. The original Pixel was best known for its camera and there's a great deal of consistency in what Google offers in the Pixel 2 too. Huawei P20 Pro vs Google Pixel 2 XL camera test: Which is best? It's still a single rear camera setup – not dual or triple like some others out there – and the camera app remains very much as it was before, but does add in some extras. There's now motion photos which look to be the equivalent of Apple's Live Photos that launched a few years ago (we're still not sure it has its place, but you can get some amusing or interesting results nonetheless). There's also a Portrait mode. The rear camera is 12-megapixels which behaves much as the previous Pixel camera. It's generally very good at taking photos, and we think that the colour balance of those photos is now much easier to confirm following the addition of the display's "saturated mode", whereas the "natural" setting doesn't give a true reflection of what you'll see when you share your pictures. The front camera gives great selfies, although we've found it's generally warmer in its results than the rear camera. The photo of yourself will be slightly more blushed than the portrait you've just taken of your loved one, but we've found it generally produces better selfies than the iPhone X, which can make you look a little fuller in the face. This highlights another consideration with the Pixel 2 XL camera: the rear camera can struggle with white balance at times. White balance was something that the Pixel XL struggled with before and it seems it's not quite right here. We particularly noticed this in our camera test against the Huawei P20 Pro. The Pixel camera is fast to focus and capture shots, but does lean on processing to then improve the photo you've taken. Various techniques are used to ensure that HDR (high dynamic range) looks nicely balanced, with highs and lows realistically presented. This is a phone where you can generally leave HDR on and get the results you want, which is one of its stand-out strengths. Then there's Portrait mode which essentially identifies the subject and then blurs the background. Software-produced bokeh is the emperor's new clothes in smartphones, trying to create that shallow depth of field effect that a good DSLR will give you. Here it's created by another AI algorithm and it's about as effective as other dual or single camera versions of this technology. However, if you happen to have hair the same colour as the background then there's a chance it will get blurred around the edges. Or, as in the example below, there's a faint halo around the head as it separates foreground from background. If you really want a great portrait effect, use a real camera, but being able to use it on the front camera can give some great selfies. It's a little strange that you can't use face smoothing and the portrait effect at the same time for total selfie overload though. It also looks like there's a little over-sharpening happening on the front camera's resulting images. Following launch, Google has added Night Sight via a software update. This mode automatically detects low-light and suggests that you use it, offering a handheld multiple exposure that turns night scenes into almost daylight ones. Night Sight hammers home just much AI matters, as it's rolling out on all Pixel phones (including the orignal) and uses AI to detect motion in order to decide what type of exposure is neeeded. It might be a longer exposure or lots of short exposures combined (if there's movement) and it will give you low-light photos that are leagues ahead of most competitors. Huawei has a similar system and both easily better the likes of Apple and Samsung. Also boosting the Pixel's performance is a second core – the Pixel Visual Core. This wasn't really part of the launch line-up, it was kept in reserve to be announced a little later. This core aims to boost photos take in other apps, bringing more camera power to things like Instagram so you get better results when using the native camera in those apps. Overall the Pixel 2 XL is undoubtedly among the best performing single-lens cameras found on a phone. And that's true over a year after launch thanks to the updates. The Google Pixel 2 XL brought with it a great deal of excitement at launch, with a sense of ambitious design, embracing the 18:9 display and moving things forward at the time, as well as adding that water-proofing to keep pace with the best out there. While the design is still good, it's not as adventurous as the Samsung and Huawei devices of this world. The Pixel 2 XL won't quite turn heads for the right reasons. While the shift in display aspect brings some glamour, it hangs onto bezel that it should have perhaps tried to eliminate for more radical looks. In its initial form, the Pixel 2 XL display didn't look good and that saw this phone stumble. But following software updates, it's now a much more compelling option: by and large this is now the pure Google phone we want it to be, once you've switched it over to "saturated" mode. The camera has a strength in HDR and although its portrait mode isn't perfect, we've seen some rivals really stumble here. You don't get the excitement of a zoom or wide angle lens, which might put some off at this price, but the addition of Night Sight makes for superb low-light shots. Overall, the Pixel 2 XL is more attractive many months after its initial launch. The display options make it much more pleasurable to use day-to-day, but now that we're deep into 2018 there are a lot of strong rivals with yet more very strong ones incoming. First published on 17 October 2017; this review has been updated to reflect software changes and contextual references. Samsung's 2018 flagship manages to offer more display with more radical design than the Pixel 2 XL. With similar hardware, plus the addition of a microSD card slot for convenience, the Samsung display looks better, while the camera is as good as Google's. It's also a touch cheaper, but won't give you the latest Google software updates quite as soon. The phone camera to beat, Huawei's take on the flagship space is one of this year's finest. Yes it has a notch, yes it's more expensive, but it's also among the most impressive phones we've seen in 2018. The OLED screen looks great too, with none of the issues some reported with the Pixel 2 XL.